Baltimore officer’s rescheduled Freddie Gray trial complicates prosecution of other cops. 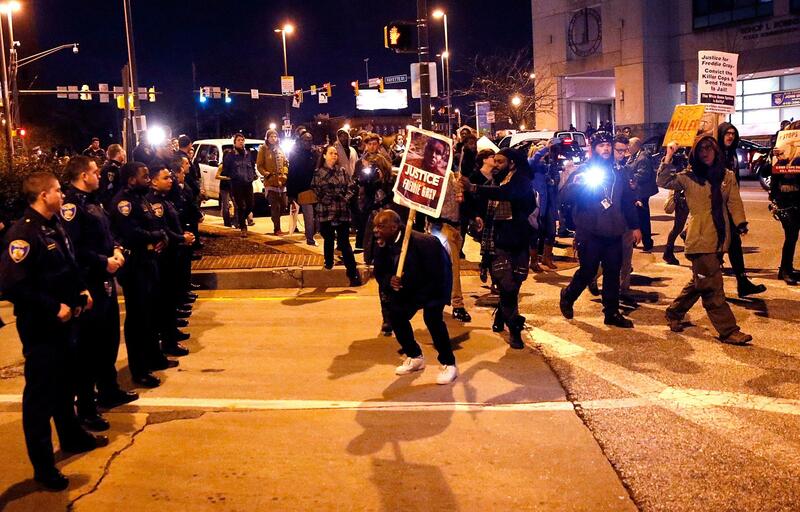 Protesters confront Baltimore City Police officers as they march through the streets after a mistrial was declared in the trial of Baltimore police Officer William G. Porter, December 16, 2015 in Baltimore, Maryland. The judge in the first trial of a Baltimore police officer for the death of Freddie Gray ordered a new trial date Monday, after the initial trial of officer William Porter resulted in a hung jury last week. Prosecutors hopes for a sting of convictions was complicated by the jury’s inability to reach a consensus verdict on Porter, who faces charges of manslaughter, assault, reckless endangerment, and misconduct in office. Prosecutors pin partial responsibility on Porter for Gray’s death because of his failure to buckle Gray into the back of the police transport van and the fact he didn’t call to get immediate medical attention for Gray after he broke his neck during the ride. The scheduling of Porter’s new trial for June 13 now puts Porter as the last of the six officers to go before a jury. And that complicates matters for the prosecutors of the case, who were poised to call Porter as a key witness in at least two of the other five officers’ trials. During his own trial, Porter testified he told the officer driving the van in which Freddie Gray was being transported that Gray needed medical help. It’s a pivotal detail that shows the driver, Officer Caesar Goodson Jr., knew Gray was hurt. Goodson’s trial is scheduled to start on Jan. 6. Now that Porter’s own legal status is still up in the air it’s widely expected he will invoke his Fifth Amendment rights protecting against self-incrimination during Goodson’s trial. “I don’t know how the state proves Officer Goodson was aware Freddie Gray needed a medic without Porter’s testimony,” Warren Alperstein, a defense attorney and former Baltimore prosecutor, told the Washington Post. “The prosecution has to be scrambling to try to figure out how to get Porter to testify in Goodson’s case.” “Experts say that if prosecutors want Porter to testify or want even to introduce his statements to police investigators, they likely will have to grant him immunity,” the Baltimore Sun reports.